Underfall Yard is managed by the Underfall Yard Trust. 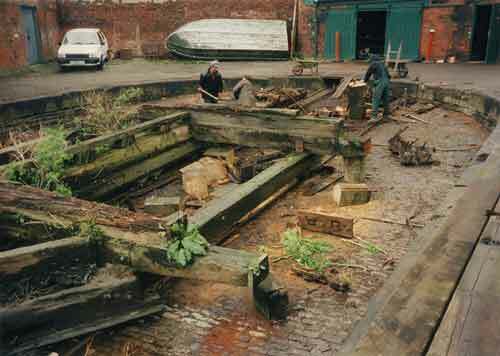 Members of the Trust rescued the slipway and buildings from dereliction in the 1990s, with support from Bristol City Council, the Heritage Lottery Fund, the South West Regional Development Authority and volunteers. Following the restoration, the yard was set up as a working boatyard with tenants, including a number of start-up small enterprises. Underfall Yard is now home to many different maritime-related businesses, as well as several clubs and organisations focused around water activities. All income from the tenants and the slipway is put back into maintaining the yard and buildings. The Trust also takes a keen interest in Bristol Docks as a whole, and in maintaining Bristol’s maritime heritage. The current chair of the Trust is Ian Wilkinson who can be contacted via the yard’s postal address.